The Hamas movement is an offshoot of the Moslem Brotherhood in the Israeli-administered territories, or as defined in the second and fifth articles of the Hamas Charter: "Hamas - the Islamic Resistance Movement - is a division of the Moslem Brotherhood in Palestine. The Moslem Brotherhood is international and the largest of the Islamic movements in the modern era...The Islamic Resistance Movement is a specifically Palestinian movement. Its loyalty is to Allah and its commitment is to Islam as a way of life". The Moslem Brotherhood in the territories was formed during the years 1967-1977, when the Islamic-religious forces joined ranks, under the aegis of similar groups in Arab countries (mainly Jordan and Egypt), to form a single movement. In 1978 the movement, led by Sheikh Ahmed Yassin, registered as a non-profit organization called the Moujama. From its founding until the mid-1980s, the Moslem Brotherhood concentrated its activities in Judea, Samaria and Gaza upon recruitment and dissemination of Islamic values among Palestinians in general and among the youth in particular. To achieve these goals, the movement strove to gain control of centers of influence and education, primarily mosques, universities and schools. The Kuwaiti daily Al-Anba (October 1988) described Moslem Brotherhood activities during this period: "During the years 1967-1975 the role of the Islamic movement was characterized by the building of mosques, bringing the [younger] generation into the fold, providing them with guidance and strengthening their ideology. To this end, the movement utilized all means at its disposal. The mosque, therefore, did not serve solely as a place of worship, but also as school, kindergarten, or even library or venue for women’s activities. Ideology and religion were preached at clubs, schools and universities, where mosques were often built and politics discussed. In this fashion the [younger] generation opened its eyes and discovered the Jewish plots against the nation." Following the assassination of Egyptian President Sadat, many Palestinians, members of the Moslem Brotherhood studying at Egypt’s Islamic universities, were deported. These students, who strengthened the foundations of the Moslem Brotherhood in the territories (particularly in Gaza), soon integrated into the educational system and the universities in the territories, recruiting others to the movement’s religious-fundamentalist ideology. On the eve of the intifada, the Moslem Brotherhood twice used the name "Hamas" for its operations. On the first occasion, a leaflet was distributed in the Gaza Strip (March 1987) decrying the use and sale of drugs and was directed at pharmacists and drug dealers who "currupt youth." The second leaflet signed by Hamas, included detailed instructions on how to beware of Israeli intelligence in the territories. The Hamas movement, however, was actually founded only after the outbreak of the intifada. Activists of the Moslem Brotherhood, who had until then concentrated primarily on religious and educational operations and had refrained from openly anti-Israel activities (for fear of IDF reprisal and possible restrictions upon the movement), came under sharp criticism from among the Palestinians. A) In the mid-1980s, a group of Moslem Brotherhood activists broke away to form the Islamic Jihad. This organization, which rejected passivity, added a national-Palestinian aspect to its Moslem fundamentalist ideology. "Jihad" activists, who advocated attacks against Israel and who carried them out as well, won great sympathy in the territories, and especially in Gaza. On the eve of the intifada, the Islamic Jihad enjoyed even greater popularity following a number of "successful" attacks carried out by its operatives in Gaza and Jerusalem, and following the brazen escape of some of the movement’s senior activists from an Israeli jail (May 1987). B) The many demonstrations and protest activities that took place during the first stage of the intifada swept the Palestinian masses, including Moslem Brotherhood activists, into the streets. The movement’s leaders began to fear that continuing to prohibit the participation of their members in overt anti-Israel activity, would rob them of the widespread support they had won, during their supporters into the arms of other organizations. C) The leadership of the Moslem Brotherhood soon understood that the "Palestinian struggle" had entered a new phase as a result of the intifada, and that whoever succeeded in controlling events in the territories would stand a better chance in the inter-organizational struggle. D) The Moslem Brotherhood leadership estimated that after many years of semi-covert recruitment and education, their movement had succeeded in winning sufficient popular support to make it difficult for Israeli forces to eradicate it, even if it were to allow its members to participate in anti-Israeli activities. As a result, in early 1988 Hamas began operating as the military arm of the Moslem Brotherhood in the territories. Hamas activities were directed against both Israelis, military and civilian, and local Palestinians - "collaborators" or those "acting contrary to Islamic values." Initially, the movement’s operations were concentrated mainly in Gaza, but later spread to Judea and Samaria as well. Hamas established a network for control and direction of protest activities, distributed independent leaflets announcing protest and strike dates different from those announced by the Unified National Command (PLO), organized widespread demonstrations and disturbances in the territories, and acted against those who "currupt morals" (those involved with prostitution, drugs and alchohol). A few months after the outbreak of the intifada, Hamas was already playing a central role in the various protest and terrorist activities in the territories, while movement activists began to carry out terrorist attacks against Israeli civilian and military targets. Hamas is one of the most extreme organizations in its attitude toward Israel. Leaflet #65 (October 1990) called upon local residents to murder Jews and burn their property. "Every Jew or settler is a target and must be killed. Their blood and their property are forfeit". In carrying out their religious duty to fight against Israel, Hamas adherents have been responsible for such attacks as the brutal murder of three workers at an aluminium plant in Jaffa in December 1990; the infiltration of a six-man terrorist squad from Jordan in March 1991 that wounded three IDF soldiers before they were caught in the vicinity of Kibbutz Tirat Zvi, and whose members carried Korans and photographs of Sheikh Yassin in addition to weapons; the murder of Shlomo Yehiya from Moshav Kadima in September 1991; and the attack at Tel Hashomer junction in October 1991 in which two soldiers were killed and eleven others wounded. The kidnapping and murder of Israeli soldiers Avi Sasportas and Ilan Saadon in 1989, were among the most serious carried out by Hamas. The attacks were carried out in similar fashion: Mahmoud Nasser (who had been released in the Jibril prisoner exchange) and Mahmoud Mabhouh, stole an Israeli Subaru automobile, donned skullcaps and gave the hitchiking soldiers rides. During the drive, the terrorists shot the soldiers with a .22 caliber pistol and then buried them. Following the murders, the two hid out in a house in the Daraj section of Gaza where they received assistance and food from local Hamas activists. After about a month, they were smuggled out to Egypt, from where they were taken to Libya. When Israeli security forces were close to discovering their hideout, senior Hamas commanders recommended that the two commit suicide and become matyrs. Hamas did not, however, concentrate only upon the murder of Israelis, and the movement’s operatives were also involved in many murders of Palestinians in the territories as well. The ideology of Hamas is a synthesis of pan-Arab Islamic religious ideals and Palestinian nationalism. The movement emphasizes that the Israeli-Palestinian conflict is in reality a religious struggle between Islam and Judaism. It is along these lines that Article 15 of the Hamas Charter (August 1988) states: "There is no escaping [the need] to make it clear to generations of Moslems, that the Palestine problem is a religious one, and must be treated as such." This view was reinforced in a booklet distributed by Hamas in early 1990 which stated: "Our struggle with the Jews is a struggle between truth and emptiness - between Islam and Judaism." Hamas leaflet #70 (February 1991) called upon the PLO to "revoke the Algiers resolutions and declare the Islamic [nature] of the Palestinian problem." Despite its emphasis upon the Islamic pan-Arab ideal, Hamas simultaneously stresses that it is an authentic Palestinian movement with the primary goal of solving the "Palestinian problem." In Article 12 of its charter, Hamas attempts to reconcile the contradiction between its pan-Islamic character and its specifically Palestinian national aspirations: "From the point of view of the Islamic Resistance Movement, nationalism is a part of religious belief. There is no greater nationalism than that inherent in a situation in which the enemy takes possession of Moslem land. In such a situation, every Moslem man and woman is obligated to participate in the Jihad." As a result of its Islamic religious viewpoint, Hamas believes that "that the soil of Palestine is sacred" and that every Moslem must take action to liberate "all of Palestine" from the Jews. The objection of Hamas to any territorial compromise with Israel, is expressed in Article 1 of its Charter: "The Islamic Resistance Movement believes Palestine to be the Islamic wakf [sacred property of all Moslems until the end of days]. Neither Palestine, nor any part of it, can be conceded. "; in Article 13: "Any concession of a part of Palestine is a concession of a part of the faith"; and in Article 6: [The movement] is striving to fly the flag of Allah over every part of Palestine." The movement’s rejection of compromise with Israel is also evident in the leaflets which it distributes in the territories. In leaflet #34 (January 1989) Hamas attacked the "traitorous views" of Palestinians who support concession of any part of Palestine. The leaflet provides the following explanation for its rejection of territorial compromise: "How can we allow the Jews to establish a state of oppression and terrorism on four-fifths of [our] holy land?" In leaflet #68 (December 1990), the movement declared it would "continue the part of Jihad until all of our blessed land is liberated from the river to the sea." A slightly more moderate interpretation of Hamas’ position regarding territorial compromise, appeared in the Jordanian daily Sawt A-Shab (18 January 1990). According to this article, Hamas could agree to territorial concessions to Israel, providing it were understood that this compromise would only be temporary, and on condition that the compromise would not obligate the Palestinians to recognize Israel’s right to exist in any part of Palestine. The article states: "Hamas believes that liberation of all of Palestine from the river to the sea, is the highest possible strategic goal. The movement believes, however, that this does not preclude liberating parts of Palestine by force or any other method, as long as this solution does not include recognition of the legality of the Zionist presence in Palestine, and as long as this solution does not revoke the right of the Palestinian people and of the Arab and Islamic nations, to liberate all of the Palestinian homeland and destroy the foreign Zionist entity." The hard-line stance taken by Hamas regarding territorial compromise also accounts for the movement’s opposition to any negotiation with Israel whatsoever, for fear that a peace process might entail a demand for Palestinian concessions as well. The movement’s Charter states in Article 13:"Initiatives and so-called peaceful solutions and international conferences for the resolution of the Palestinian problem, are contrary to the views of the Islamic Resistance Movement... These conferences are nothing but another method by which the infidels take possession of Moslem land. When did the infidels ever deal justly with sons of the faith?... The only solution to the Palestinian problem is Jihad. All of the initiatives, proposals and international conferences are a waste of time." In Article 32 of the Charter, the movement expresses its opposition to any bilateral agreement between Israel and the Arab states: "World Zionism and the imperialist forces are cleverly trying through careful planning to remove the Arab states, one by one, from the arena in order to isolate the Palestinian people.... The Islamic Resistance Movement calls upon Arab and Moslem peoples to act seriously and continuously to thwart this fearful plan, and to awaken public awareness to the danger involved in withdrawal from the field of conflict with Zionism." In Hamas leaflets distributed over the past few years in the territories, the movement has expressed its opposition to every possible peace plan that has arisen. In leaflet #46 (September 1989) the movement rejected Egypt’s ten-point peace plan and warned Palestinians against contact with the United States. In leaflet #55 (March 1990) the movement attacked Palestinian figures who had met with former U.S. President Carter, and declared that these were trying to revive Camp David accords and that they do not represent the Palestinian people. Predictably, Hamas also opposes the current peace talks between Israel and the Palestinians and other Arabs. The talks that began in Madrid and have continued in Washington, have aroused the anger of Hamas, whose activists have vowed to do everything in their power to undercut them and have branded the Palestinian delegates as traitors. In the absence of any willingness to accept territorial compromise, and in the light of the movement’s adamant refusal to conduct negotiations with Israel, the only path left open to Hamas for the resolution of the Palestinian problem, is that of violent struggle to the death - the way of Jihad. Since its founding, Hamas has emphasized the imperative upon Moslems everywhere to take part in the Jihad for the liberation of Palestine, as expressed in Article 14 of the charter: "It (the liberation of Palestine) is the personal obligation of all Moslems everywhere. The problem must be viewed on this basis, and every Moslem must understand this;" and in Article 15: "The day upon which the enemy steals a part of the Moslem lands, Jihad becomes the personal obligation of every Moslem. In light of the Jewish theft in Palestine, there is no alternative but to raise the flag of Jihad." The movement, however, defines Jihad in a broader sense. Jihad, according to the charter, "is not limited to bearing arms. The struggle against the enemy, with an appropriate word, a good article, or a helpful book; through support and assistance, when done in the name of victory for the flag of Allah - are all Jihad for the sake of God." In an interview with Hamas leader Sheikh Ahmed Yassin in Yediot Ahronot (September 1988), there appeared, nevertheless, to be a remote chance that the movement might agree to negotiations with Israel. Yassin declared: "As long as we ourselves have not liberated any part of Palestine, there is no point in beginning these proceedings. Their time has not yet come. The PLO must exercise patience and not recognize Israel, since Israel has taken everything from the Palestinian people and given nothing in return. Israel must first restore the rights of the Palestinian people. Only then will it be possible to talk." In an interview with Israel Television’s Arabic service (while imprisoned in September 1989), Yassin explained that he would agree to peace talks with Israel providing that both the terms of the peace plan and the final objectives of negotiations were clear. A short time later (December 1989), the movement’s representatives in the territories demanded that the PLO allot five places to Hamas on the delegation then taking shape for negotiations with Israel. It should be noted that the hierarchical structure of Hamas (the leader of the movement is not only its central political figure, but also the highest religious authority) grants its leadership room to maneuver regarding negotiations with Israel. Thus, if at some point, the movement’s leaders feel it is in its interest to do so, they might find religious sanction for its participation in a peace process in the region. Hamas is opposed to the idea of autonomy in the territories since, according to Sheikh Yassin, "the actual meaning of autonomy is that the Jews will have everything and the Palestinians nothing." The final goal to which the movement aspires, is the liberation of all of Palestine and the establishment of an Islamic state from the river to the sea. In this regard, Hamas also opposes an independent Palestinian state. In an interview in Haaretz, Gaza Hamas leader Mahmud Azhar state: "The Palestinians were always part of a pan-Islamic state.... In Europe they are now establishing an economic union and soon they will also establish a political union. This is the direction in which the world is going today. We Arabs have one culture and one language. The borders of the different states in the Arab world are not our borders, but rather borders set by France and Britain. The border with Egypt is not our border and the border between Iraq and Syria is not our border. Nasser wanted to establish a pan-Arab state in his way, the secular way, and failed. Now we want to try this idea our way". In the ideal Islamic state, according to Hamas, peace and tranquility will reign, as stated in Article 6 of the charter: "Alongside Islam, adherents to all religions will be able to live in peace and safety to themselves, their property and their rights." It appears, however, from other articles in the charter and the movement’s various publications, that the attitude of Hamas toward Jews in general and Israelis in particular, is not as humane as the movement would have it seem. In leaflet #34 (January 1989) the movement called upon residents of the territories to "destroy the Jews and take revenge on them". Article 7 of the Charter quotes from the Koran: "The hour will not come until the Moslems fight the Jews and kill them, so much so that when a Jew will hide behind a tree or a stone, these will say: "Moslem, servant of God, there is a Jew behind me. Come and kill him." The Kuwaiti daily Al-Anba (October 1988) offered an explanation of the movement’s attitude toward the Jews: "Allah gathered the Jews to Palestine not so that it should serve them as a homeland, but rather so that Palestine should serve them as a cemetery. Allah will rid the entire world of the Jewish affliction, and just as pilgrims atone for their sins by offering a sacrifice at Mecca, so the Jews will be offered as a sacrifice at Al-Aqsa by hands as pure as those of the pilgrims." Following the outbreak of the intifada, the leaders of the Moslem Brotherhood decided that the time had come to found a military arm, which would take part in resistance and protest activities in the territories, in terrorist attacks against Israel, and in the Palestinian inter-organizational struggle for control in the West Bank and the Gaza Strip. Some of the central sections of Hamas (such as the military and security sections) were, therefore, built upon the existing Moslem Brotherhood structures established during the 1980s. Sheikh Ahmed Yassin, aged 47, and the father of 11, is still considered the leader of Hamas. He is confined to a wheelchair, the result of a fall on the beach in his teens (there are those who claim he was injured in an explosion). Despite his disability, he studied at Ein Shams University in Cairo and returned to Gaza as a teacher. In November 1989, Yassin was charged with having devised the goals of the organizations he had founded, directing their activities, passing on extensive financial assistance to them, receiving reports on their activities, ordering the murder of three collaborators and planning further murders. In October 1991, he was convicted and sentenced to life imprisonment plus 15 years. Following the arrest of Sheikh Yassin, Dr. Ibrahim Yazouri was appointed Head of the Moslem Brotherhood. Arrested in 1990, Yazouri was found guilty of serious security offenses and of having been responsible for the deaths of the two Israeli soldiers. In its founding stage during the early months of the intifada (1987-1988), the movement concentrated upon building its sections and activating its members. The institutionalizing stage came in 1989, during which the movement worked on strengthening its infrastructure while establishing low-level ranks of command on the regional level. The reorganizing stage began following the first wave of arrests of the senior and mid-level leadership of Hamas in late 1989. Israel’s determined action against the Islamic Resistance Movement and its leaders, was a severe blow to the movement and forced it to restaff most of the senior positions in its various divisions. The movement was also forced to move its leadership to Jordan, to build its control facilities there, and to establish its apparatus there along lines similar to those in the territories. The military section of Hamas (called Mujahedim A-Falestinin) was founded in 1982 as an independent body affiliated with the Moslem Brotherhood. This section concentrates on planning and carrying out attacks against Israeli military and civilian targets both in the territories and within the "Green Line." The leaders of the military section order operatives to carry out terrorist attacks, provide them with material, and brief them prior to carrying out operations. The section operates under great secrecy, employs various methods of hiding and relaying arms and information among the movement’s activists, and trains operatives in various methods of fighting, often including the use of live weapons and the preparation of explosives. Until the end of 1989, the military arm was headed by Sheikh /Salah Shahadeh, and since his arrest is apparently operated from Jordan and perhaps even (through messengers) from Israeli jails. The Hamas security section, Al-Majd (Glory), was founded in 1987 (before the intifada) within the Moslem Brotherhood in the territories. The aim of this section, as defined by the movement’s leaders at the time, was to fight "corruption" in the territories and to monitor Palestinians suspected of collaboration with Israel. These tasks gained added significance with the establishment of Hamas, and operatives of this division began to interrogate, judge and carry out sentences issued by makeshift courts against Palestinians suspected of transgressing against the precepts of Islam (such as drug trafficking and sexual misconduct), or of collaboration with Israeli security forces. In this fashion, operatives of the section brutally tortured and murdered dozens of Palestinian "collaborators" during the years 1987-1991. Another task entrusted to the security section was the gathering of information on the activities of other Palestinian organizations in the territories, including surveillance of their operatives, gathering of leaflets distributed by them, and even planting Hamas agents in their ranks. Among the material discovered in the Hamas archive seized by Israeli security forces in 1989, were surveillance reports on activists in other organizations, as well as documents instructing Hamas operatives on how to infiltrate other organizations and plant agents. As opposed to other Palestine organizations in the territories, Hamas found no need to operate a special section for the dissemination of its ideology among the residents of the territories. Hamas, established by the Moslem Brotherhood, simply employed the dozens of mosques and Islamic associations already existing in the West Bank and Gaza to this end. The movement’s information section was, therefore, charged with the dissemination of its decisions and instructions regarding strikes, demonstrations, etc., among the entire population of the territories and not specifically among Hamas activists. Operatives of the Hamas information section are responsible for writing the movement’s leaflets and distributing them throughout the territories, for which purpose they use a vast network of messengers and a modern system of facsimile machines (some of which were seized by Israeli security forces in 1991). The information section is also apparently responsible for the publication of the movement’s various periodicals in Arab countries and Europe (i.e., Falestine al-Muslimah,ýý published in the U.K.). The section apparently maintains strong ties with pro-Hamas newspapers published within the "Green Line" by Moslem activists in Israel, as well. The "uprising" section of Hamas is responsible for organizing and implementing protests and demonstrations in the territories. Section members write anti-Israel slogans on the walls of buildings, prevent Palestinians from going to work in Israel, and initiate local clashes with the IDF including stone-throwing and roadblocks. This section is also in charge of distributing leaflets on the street, organizing strikes and enforcing them, and distributing funds to needy families. At the head of Hamas and subordinate to the movement’s leader, Sheikh Yassin, stands the Steering Committee, which includes Sheikh Mohammed Abu Zid, Sheikh Bassam Jarar, Sheikh Jamal Hamami and others and serves as the movement’s senior ideological and religious authority. Following the arrest of Sheikh Yassin along with a number of the members of the Steering Committee, new activists were appointed to leadership positions, and the involvement of Jordan-based Moslem Brotherhood leaders in Hamas activities in the territories increased. Lower down in the Hamas hierarchy is the Central Committee, in charge of planning and coordination of the movement’s operation in the West Bank and Gaza, and compromising four members: three from the West Bank and East Jerusalem, and one from the Gaza Strip. Hamas operations sectors include the Northern Sector (the Nablus Sector - coordinating activities in Jenin, Nablus and Tulkarem), Jerusalem, Hebron and the Gaza Strip. Part of the regional command structure was unearthed by Israeli security forces in February 1991 and the regional leaders, who had been operating under the guise of press offices, were arrested. Hamas receives funds from three main sources: a) Donations and dues from members and supporters in the territories (often the result of coercive campaigns rather than of a genuine desire to give); b) Special fund-raising campaigns held in large Arab and Moslem communities in Arab countries (such as Iran, Saudi Arabia and the Gulf states), and Islamic charitable institutions in the various Arab countries. Hamas exerts great efforts at fund-raising among the Moslem communities in the United States. As part of the campaign to strengthen ties between Hamas and Moslem activists in the U.S., the movement’s Third Congress was held in late 1990 in Kansas City, with the participation of senior Hamas activists. An article critical of Hamas and representing the views of Fatah, which appeared in the PLO weekly Falestin A-Thawra published in Nicosia, questioned the sources of the money reaching Hamas and stressed that the receipt of funds by Palestinian organizations not via the PLO, in fact, harms the interests of the Palestinian people. When Hamas was founded in the late 1980s, many Palestinian organizations had already been operating in the territories for some time. These organizations represent a wide range of national and social views and can be divided into four groups: a) Mainstream (headed by Fatah-Arafat); b)Leftist (including the Popular Front for the Liberation of Palestine, headed by George Habash and the Democratic Front for the Liberation of Palestine, headed by Naif Hawatmeh); c) Pro-Syrian (including the Jibril Front, A’Saiqa, and Fatah-Abu Mussa); d) Islamic (including the Islamic Jihad and Hamas). Hamas’ attitude toward the PLO is ambivalent: sympathetic (as a relative and a partner in common goals and interests), but opposed to the PLO’s secular outlook and its methods of operation in the international arena. Despite attempts by mainstream groups to bring Hamas into the fold, the movement has refused to participate in the joint leadership of the intifada represented by the Unified National Command. At times, Hamas has maintained strong ties with PLO activists in the territories - especially on the tactical level. At others, the political and ideological differences have caused tension which has even led to street battles between activists of the two organizations. In the mid-1980s, as the religious revival in the territories began to gather momentum, the rise in the popularity of the Moslem Brotherhood became a matter of concern among the PLO leadership, and the inter-organizational competition could be feld in the struggle for control of the universities and Palestinian public opinion. This competition was often accompanied by violent clashes between the rivals (using stones, clubs and axes), in some cases leading to killings. By 1988, Hamas was enjoying incredible success, evident from the many Palestinians joining its ranks and the response to its leaflets calling strikes and demonstrations on days other than those called for by the PLO. During May and June 1991, as the U.S. worked to bring the Palestinians into a peace process, the rivalry between the two organizations was marked by violence - using live weapons at times - mainly in Nablus. Such conflicts were renewed at the end of 1991 and the beginning of 1992 against the background of the decision by the PLO mainstream to participate in the peace talks with Israel in Madrid and Washington. The year 1991, saw a number of setbacks in the standing of Hamas in the territories, which affected its relations with the mainstream in Fatah. At the outbreak of the Gulf War, support for Hamas in the territories had reached its peak. "The mother of all wars" stimulated deep religious feelings among the Palestinians and wall slogans in support of Saddam Hussein and Hamas appeared on houses throughout the territories. The defeat of Iraq also affected the Palestinians own sense of security and their belief in the ability of the Islamic organizations to solve the Palestinian problem and to destroy Israel by force, which resulted in a decline in the standing of Hamas in the territories. Yet the rise of the independent Islamic Republics out of the former USSR at the end of 1991, as well as the success of the Moslem Brotherhood in Algeria, coupled with frustration at the lack of success of the mainstrean PLO in the peace talks with Israel, have all worked to improve the prospects of Hamas in the territories. The leftist organizations - the Habash Front, the Palestinian Communist Party, and Naif Hawatmeh’s Democratic Front for the Liberation of Palestine (which during the intifada joined the mainstream group and participated in the Unified National Command) - are considered totally abhorrent by Hamas. In September 1988, Sheikh Yassin stated with regard to the communists: "No, I do not see any possibility of cooperation with them. They are heretics." The pro-Syrian groups, like most of the terrorist organizations, are secular in their outlook and, moreover (as opposed to Fatah-Arafat), also serve as Syrian puppets in the Palestinian arena. On the other hand, however, after Hamas leader Sheikh Yassin had been sentenced to 12 years imprisonment for possession of large quantities of arms and for heading a hostile organization in the mid-1980s, he was released through the intervention of Ahmed Jibril’s pro-Syrian organization, which demanded Yassin’s release as part of its prisoner exchange with Israel. The Islamic Jihad - Hamas’ rival in the Islamic camp in the territories - was, in fact, the catalyst for the establishment of the Hamas movement. It was the achievements of the activist Islamic Jihad and the popularity it enjoyed among Palestinians during the period prior to the outbreak of the intifada and during its first few months that, inter alia, brought the leaders of the Moslem Brotherhood to the realization that they must take an active part in the Palestinian struggle in the territories. Since the Islamic Jihad and Hamas both derive their support from the same group - the religious fundamentalists in the territories - the rivalry between the two movements is great. Stategically, the two organizations strive for the same goals: the liberation of Palestine through uncompromising armed struggle, and the establishment of an Islamic religious regime in the liberated territory. However, while the Islamic Jihad strives for an Iranian-style Islamic revolution in Palestine with Iranian support, Hamas is critical of the Islamic Jihad’s ties with Iran. Hamas also collaborates with Islamic fundamentalists in Israel. The leader of the Islamic movement in Israel, Sheikh Abdullah Nimr Darwish, in December 1989 called Hamas "an integral part of the Palestinian people, struggling for an independent state." Most of this co-operation, however, is limited to dissemination of the movement’s ideology through newspapers printed and circulated in Israel (such as Sawt ak-Haq W’al-Hourriah - The Voice of Justice and Freedom - published in Umm El-Fahm, and closed in 1990 by the Interior Minister for three months for anti-Israel agitation), and technical assistance in printing the movement’s leaflets in Israel. Hamas continues to increase in strength in the Israeli-administered territories and more and more is coming to threaten the exclusive position of the PLO. The future growth of the movement may depend in a large part on the outcome of the current peace talks. Lack of progress in the talks as perceived by the Palestinians, may well work to the advantage of the Islamic fundamentalists. 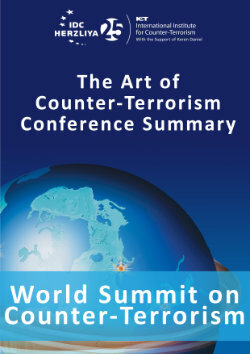 Boaz Ganor is a researcher, author, and consultant specializing in counter-terrorism. 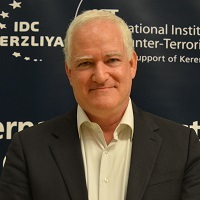 He is the General Director of the International Policy Institute for Counter-Terrorism in Israel. Ganor is currently completing his Ph.D. thesis on "Israel’s Counter-Terrorism Strategy" at Hebrew University. Is Hamas Revaluating the Use of Terrorism?